Her name is Pandara★♥. She added the star and heart to her name, to reflect her individuality. Pandara★♥'s parents raised her to feel special, especially since pandas are an endangered species. At the community garden, passerbys will ask Pandera★♥ why she's pink. She replies, "I'm 1/8th flamingo." Everyone oohs and ahhs, and she likes their reaction. "Wow, you're so exotic!" I need pattens!!! :-) So cute!! Yay! I love this little gal! Adorable! actually... *Ohhh* *Ahhhh! * You're an exotic beauty! Another wonderful job!! She's lovely! Your ami's are adorable! What I like most though, are the pics and stories with them! Wonderful fun! Oh! 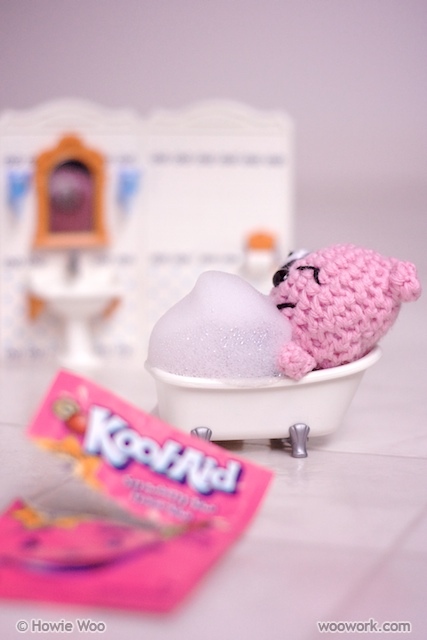 LOVE the KoolAid bubble bath! Oh my god! The mini garden!! The bath tub! This whole thing is too cute. Rebekah: hehe Thanks for your yay! K4TT: Oh, she's gonna love your oohs & ahhs ;) How generous of you! Jana: Thanks, I also like seeing each of their personalities come to life. After awhile, their stories write themselves! Vicki: hehe I'm glad you like the cuteness overload. It was fun setting up the bubbly Playmobil bathroom set. 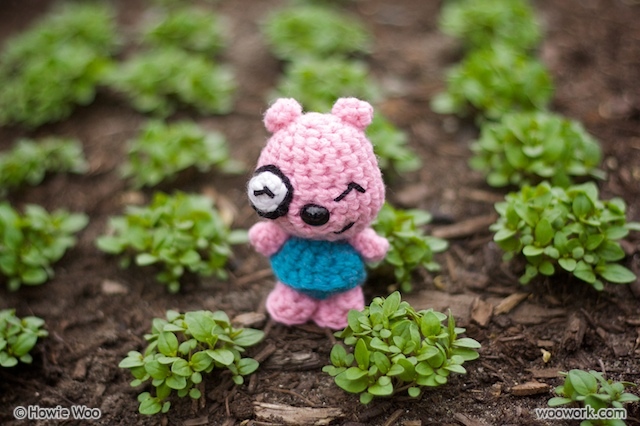 By the way, the expert at arranging lovely set pieces for cute amigurumi is Tada's Revolution. Very cute - just love the photo of her 'secret' in the bath. Very cool. Hahaha @ bathroom shot. Is panda aware of being photographed at such an intimate time? Once when I was in 7th grade I thought it was a good idea to dye my naturally blonde hair blue with kool aid. It turned out booger green. Unlike Pandara, I didn't need a star and a heart after my name to be considered "special". Yep, you need to sell your patterns. Seriously. Love all of the critters and their photo ops. Too cute! Hilarious, cute & sweet with a dash of exotic!!LOVE!!!!! I love the bubblebath with pink cool-aid!! 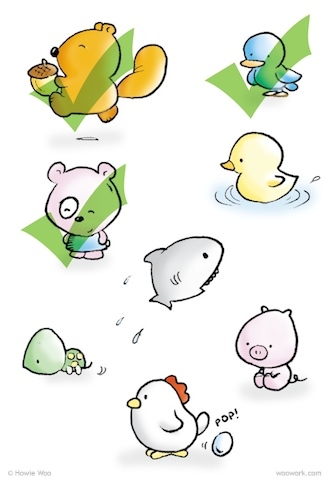 Your critters have such interesting personalities! aahahahaha!! I -love- the "real" reason for her pink fur. twistyfishies: Thanks, I'm glad you find Pandera★♥ adorable :) She always stood out to me in the drawing because of her beyond-natural pink colour. Danielle: hehe I'm glad you like the punchline! As someone who dyes his hair, I shouldn't be revealing her Kool-Aid secret, eh? Sorry, Pandara★♥! I'm in love... with a panda. oh my gosh! this is too cute for words! 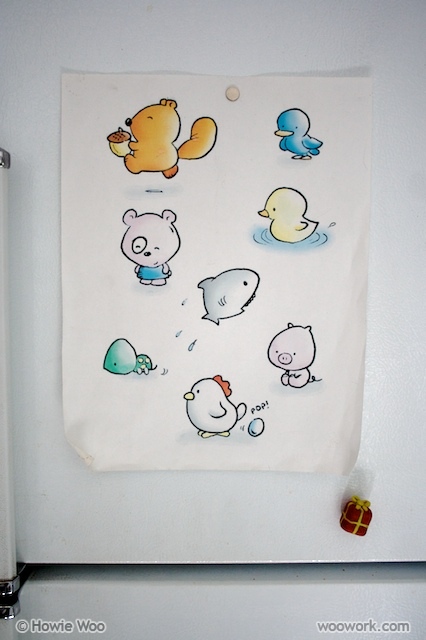 and the chicken! and the shark!!!! I love the stories that go along with the characters! You're so creative and I can't wait to see and read about the rest of them! Ohhh... Pandera is so adorable. I like that she's proud to be exotic. My children are 1/4 Chinese. Do you think that makes them exotic, too? He-he! PS. I love the little snail on the flower stalk who's admiring Pandera's loveliness. So cute >w< I love the way you shoot those lovely photos! Beansieleigh: Yes, she seems to enjoy the kind of attention that a Hollywood starlet would receive! Kool-Aid bubblebaths do seem very J.Lo! ;) Thanks! Rabbiz: Thanks for the photo compliments! 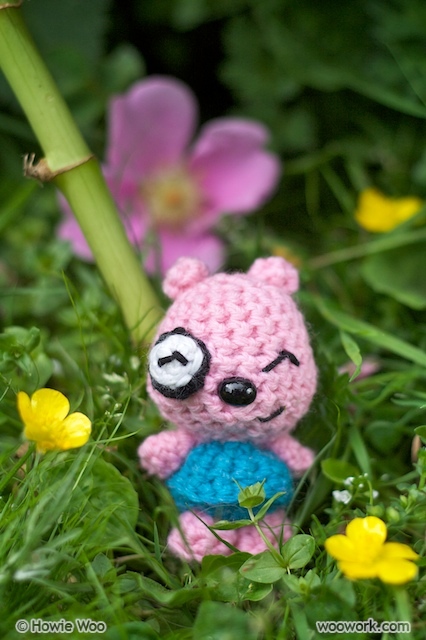 The photos you take on your amigurumi blog are some of the most beautiful I've seen!